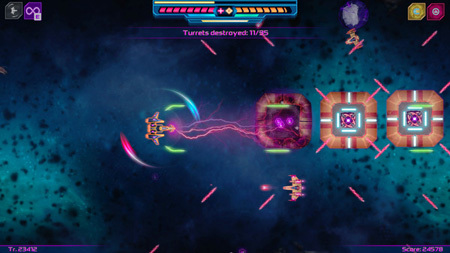 INSPACE 2980 is a stylish and dynamic SHMUP from R_Games. Take part in an exciting adventure and save the galaxy. The endless stream of various enemies won’t let you rest until the very end of the battle. There are ten characteristics of the ship, which can be improved, as well as many power-ups that will enable you to deal more effectively with hordes of enemies. Drones will help you survive even the fiercest battles. They will repair your ship or help you destroy the enemy. With the help of special abilities, you will be able to handle even the most difficult tasks. You’ll find a strategy for any enemy. Choose from missiles, laser beams, electric discharges, plasma guns. There are a large number of different enemy units, with different appearances and behavior. If you get stuck in the game, check out the video walkthrough and gameplay for the game. This entry was posted in PC Games, Walkthrough and tagged INSPACE 2980 Cheats, INSPACE 2980 Game, INSPACE 2980 Gameplay, INSPACE 2980 Guide, INSPACE 2980 Hints, INSPACE 2980 Review, INSPACE 2980 Solutions, INSPACE 2980 Strategy, INSPACE 2980 Tips, INSPACE 2980 Walkthrough by Marvin. Bookmark the permalink.